Facts sure can ruin a good story. He was from Maryland, kicked around in baseball for a handful of seasons, led the National League in triples in 1879, and once went 6-for-6 in a game. He wasn’t Lewis Pessano. And, he is probably not Italian American. I’m not sure why the Chicago-based Italian-American Sports Hall of Fame ever thought he was. Dickerson was “better known” as Dickerson, because Dickerson was his name. His middle name was Pessano, but he was always a Dickerson. And, so was his father. The implication that “Lewis Pessano” was so traumatized by ethnic bigotry that he was forced to change his name to avoid the stigma of being a low-class Italian just isn’t true. Take a look at these facts, culled from U.S. census and Maryland records. Dickerson was born Lewis P. Dickerson in 1858 in Tyaskin, Maryland. His father was William P. Dickerson, an illiterate oysterman. (The elder Dickerson is listed at one point as William Porter Dickerson and is always listed as being born in Maryland.) William can be traced back to the 1840s on Maryland records. Lewis’s mother is Mary P. (Larmore) Dickerson, also born in Maryland. Both parents are buried in St. Mary’s Episcopal Cemetery in Tyaskin. Buttercup Dickerson wasn’t the first Italian American baseball player, because he wasn’t Italian American. But, he was a baseball player. “L.P. 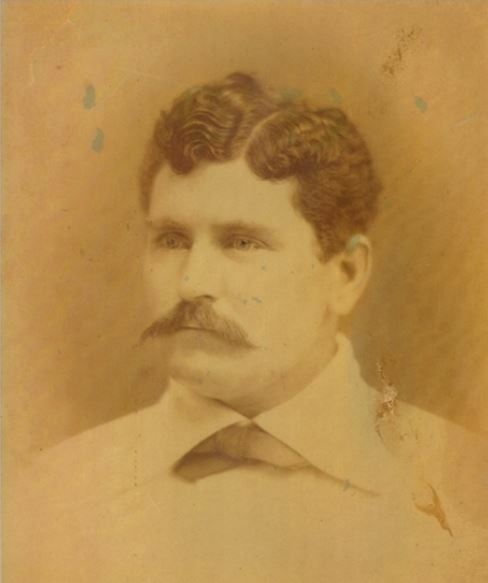 Dickerson” joined the Cincinnati Reds as an outfielder in July 1878. He batted .309 in 29 games that season. In 1879, his 14 triples for Cinci over 81 games led the league. That’s it. That’s the first and last direct reference to Dickerson being called Buttercup that I can find. News reports are spotty, but in most cases he’s called Lew, occasionally Lou, and most often, just Dickerson. Never Pessano. And, never again Buttercup. 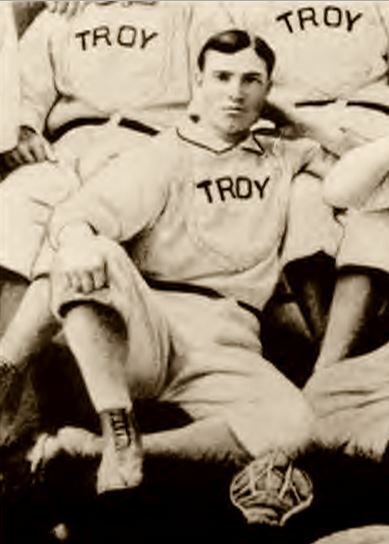 Dickerson kicks around from team to team – Binghamton, Cincinnati, Troy, Worcester, Pittsburgh, St. Louis, Baltimore, Louisville, Buffalo, Norfolk, Chattanooga – playing mostly in the outfield and getting suspended at least a couple times for carousing and being a drunk. There’s plenty of mentions of Dickerson’s drinking. And, to be singled out for being a “lush” at a time when hard-drinking and hard-living was the common ballplayer trait is pretty telling. He reappears two days later. Playing for Baltimore. In April 1885, he signs with the Omaha Omahogs of the new Western League, pockets a $100 advance, and then quickly skips town to join the National League’s Buffalo Bison. Dickerson’s recorded stats dwindle after 1885, but I’m pretty sure he played a good bit longer. Through 1891, he is regularly listed as a “ballplayer” in the annual Baltimore City Directory. By the mid-1890s, he is reported to be a “salesman” and, in 1896, a “huckster,” which made me smile until I realized that back then a huckster was simply a door-to-door or street salesman. In 1898, he is again listed as “ballplayer.” So, he continued to make some living at baseball far longer than the records show. Things are never quite as simple as they seem. And, often the real story isn’t nearly as nice as the one we’ve come to know. Buttercup Dickerson was probably not the first Italian-American ballplayer. And, “Buttercup” was likely a fleeting nickname. But, we do know this. Dickerson was a heavy drinker, broke contracts and jumped teams, and didn’t seem like a particularly nice fella. He had a couple awfully good seasons playing baseball, and plenty more mediocre ones. He married, had a son, and died in 1920. He was inducted into the Eastern Shore Baseball Hall of Fame in 1996 as the first big leaguer to come from the Eastern Shore of Maryland. Well, that much is true. And, really, you thought I wouldn’t include a link to this? This entry was posted in Baseball, Baseball History and tagged 19th Century Baseball, Buttercup Dickerson, Cincinnati Reds, Italian Americans, Maryland by Jackie, The Baseball Bloggess. Bookmark the permalink. Very wonderful. Nice, nice job. Oh, thank you! That means a lot coming from you! Great sleuthing! Interesting story. My family and I were just talking about our grandparents entry to the US and how random and imprecise the recordkeeping was back then. Misspellings, name and date changes. It’s a wonder we can trace our geneology at all. Buttercup doesn’t fit the guy. Good PR perhaps. Funny to read about Italian ball player just now. I just walked past Joltin Joe’s relative’s barber shop. Photos of Joe adorn the walls. I think there may be a Dom or two in there also. I’ve only been inside once or twice, years ago. Other than the great feeling that comes from sitting in a chair in the shop with “Dimaggio’s” on the window, it wasn’t the place for me. The haircuts just wasn’t right. I am Louis P. Dickerson’s great nephew – my grandfather (Richie Leigh Dickerson) was Louis P.’s younger brother. The comment ” … that the middle name Pessano was given in gratitude to the attending physician at Lewis’ birth, a common tradition at the time” indeed tracks with another Dickerson’s middle name. Richie Leigh Dickerson’s oldest son was William Cadmus Dickerson. The middle name Cadmus was the attending doctor at William’s birth. William later founded Dickerson Boatbuilders in Cambridge.